SOME OF BRITAIN’S top women genre artists and executives in both South Asian classical, popular and western music and its production will come together at a special conference in London to discuss challenges and a better and brighter future. 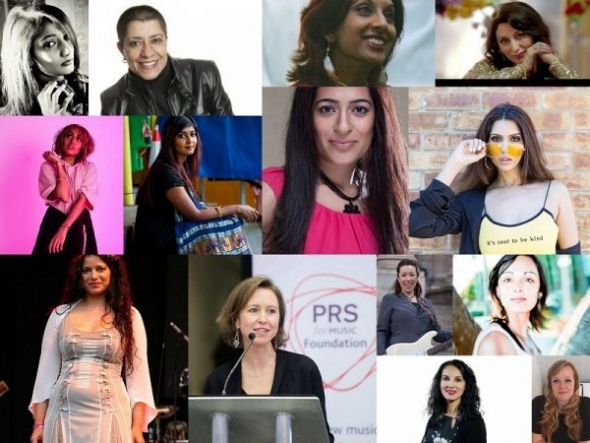 More than a dozen trailblazers – many from a South Asian background – who have made a name of themselves in the music scene in Britain will discuss opportunities and challenges at the Women in Arts Conference in London on Monday (August 13). The conference forms the final segment of the Women in the Arts Festival organised by Sama Arts Network and director and founder Jay Visvadeva. The festival concludes its more than three-month long offerings on August 16 with three nights of preceeding consecutive concerts, starting with Nicki Wells who is a versatile vocalist and sometime Hindustani singer, well-known for her collaborative work with Nitin Sawhney. She sings tracks from a new album, ‘Turya’. The conference, which begins on Monday afternoon, sees Vanessa Reed, Sheila Chandra, Pam Sidhu, Mithila Sarma, Rowena Morgan, Verity Pabla, Swaati, Unnati Dasgupta, DJ Ritu and Harriet Wybor talk about their experiences and how women might be better able to break down barriers and fulfil their potential in a business and artform still dominated by men. Visvadeva said he and a number of organisations in the UK have worked hard to address the imbalance in the British Asian classical music scene. “The arts of South Asia are exceptionally male-dominated, given the inherently patriarchal framework of sub-continental cultures. This necessitates the occasional intervention,” noted Visvadeva. He said men are welcome to attend the conference and participate in the discussions. The objective of the conference is to highlight good practice, share ideas and set out a way forward in which to help those coming through, those already established and looking to climb to the next level and the many who just want to see a level playing field and real equal opportunities. “Through music we seek to ask those tough questions that are often ignored about the role of women in British Asian communities, which often struggle with the challenges of the 21st century – not infrequently because of lingering traditional perceptions of gender roles,” added Visvadeva. Zoe Rahman, contemporary pianist and jazz composer plays on Tuesday (14). Patricia Rozario, a soprano, sings classical and western opera, and the festival concludes with ‘Calcutta’, described as ‘English baroque meets Indian Music’ on the final night of August 16. Vanessa Reed is chief executive of the Performing Right Society (which represents many music artists in the UK) for Music Foundation and has been in her position since 2008. She has been a champion of new voices and is keen to support women looking to make a career out of music. She is widely regarded as one of the most influential women in the music industry in the UK. Sheila Chandra is a self-trained Indian classical music vocalist and one of the earliest UK-born artists to emerge on the scene here. Her work with Steve Coe and the band Monsoon broke new ground in the UK in the 1980s mixing traditional Indian sounds with discernible western pop elements. DJ Ritu remains very active on the music scene and is much-sought after DJ. She has been the unofficial UK ambassador of Bhangra music and has exported it around the world to many new territories when it first emerged in Britain in the late 1980s and early 1990s. She is the co-founder of Outcaste Records and helped to carve out careers for artists such as Sawhney and Badmarsh and Shri. She still plays at Club Kali. Verity Pabla runs I am not a machine music and releases her own music under this label and has worked across the globe with other musicians on a range of styles and compositions, as both a singer and songwriter. Unnati Dasgupta is principally a classical Indian vocalist and has performed around the world and among her more recent work is a dance & audio-visual production of Rabindranath Tagore’s ‘Gitanjali’ directed by writer and filmmaker Sangeeta Datta. This was a support act to Bollywood music supremo’s Shankar-Ehsaan-Loy concert at the Royal Albert Hall and other large-scale venues. Swaati is self-awowedly hard to categorise as an artist and singer – one description states ‘Lykke li meets London Grammar’. She continues to collaborate and make music with others from around the world who share her eclectic tastes and sensibilities. Harriet Wybor is also from PRS and represents the interests of its classical music members. She also delivers education and outreach programming. Monday, August 13 – keynote speech; panel discussion, business of music; music publishing; talent development and artist management; finance and fundraising. All at venue: Wilton’s Music Hall, 1 Graces Alley, Whitechapel, London E1 8JB. ‘Richard II’ – as it closes, what does it mean to be English?